Why was Food Babies Defunct? Why Was I De-funked? I still open Food Babies to access certain recipes on a regular basis, but life got in the way of me keeping up with my low priority mission to type up my recipes. In the meantime I was diagnosed with Celiac Disease, which means I need to follow a gluten-free diet, which bummed me out considerably given my penchant for baking. 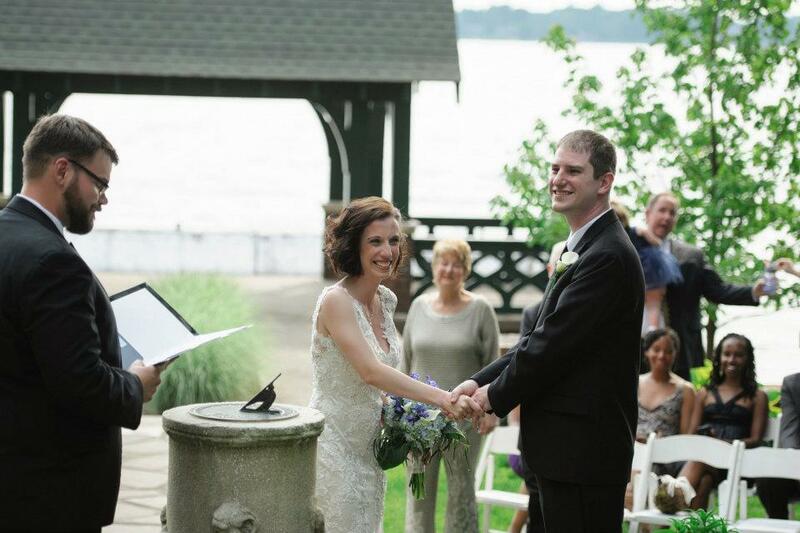 Other things happened in the meantime as well; KK got married and I finally earned that elusive Ph.D. Coming up on the Food Babies horizon (hopefully): gluten-free chocolate cookies with peanut butter middles. Cheers! This post is brought to you by mi esposo, Kelly! The man taught himself how to make cheese. 1. First you will want to dissolve your rennet into 1/4 cup cold unchlorinated water, bottled water works, or if you have a brita, etc. that works too. Dissolve your citric acid into 1 cup cold water. 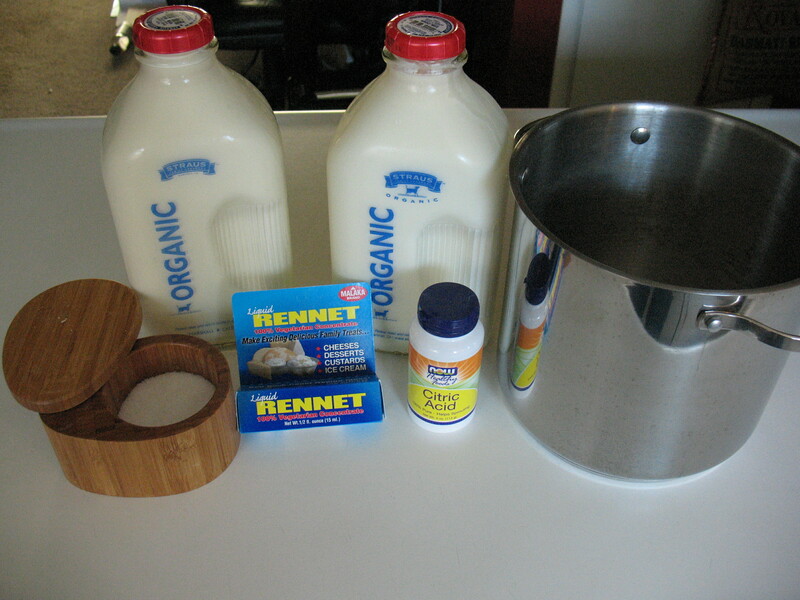 Add the citric acid solution and the cold milk to the pot, making sure they are mixed well; this brings the milk up to the right acidity and helps it stretch better later. Heat the milk mixture to 90F, stirring occasionally to prevent scorching. As the milk reaches 90F you should notice it starting to curdle due to the citric acid and temp- if it hasn’t started to curdle yet it’s okay to raise the temp to 95F or even 100F. I had to heat mine to almost 105F. After it reaches 90F and has curdled a little, remove it from the heat and slowly add the rennet. Try to mix it in a top to bottom motion for approx. 30 sec. Then Stop! Cover the pot and leave for 5 min. 2. Now it’s time to check the curd. It should look like custard, with a clear separation between the curds and whey. If the curd is too soft or the whey is still milk colored let it sit for a few more minutes. Cut the curd into 1″ to 2″ checker board pattern. Mine looked like a blob so I couldn’t do this- so I just cut it into as small of pieces as I could. You want to use a knife you don’t care about too much cause you have to leave the curd in the pot while you cut it and it will dull your knife. Now place the pot back on the stove and heat the curds and whey up to 105-110F. Take off burner and slowly stir curds for 2-5 min, more time will make a firmer cheese. 3. Now strain your curds from your whey, saving the whey. I did this with a strainer and cheese cloth. Press the curds lightly with your hand, pouring off as much whey as possible. At this time heat your saved whey up to 115-120F. While the whey is heating up put the curds in a microwaveable bowl and heat on high for 30 sec to remove more whey. On a clean surface knead your cheese like bread dough (take off any rings- i found that out the hard way). Microwave 1 more time for 30 secs. and repeat the kneading until the cheese is smooth and shiny. Add salt during this kneading step. 4. At this point the cheese should be soft and pliable enough to stretch like taffy. If not, soak it in the heated whey for about 30 secs. This was my favorite step, it made me feel like a kid again. After you take it out of the whey you should be able to stretch it for about 1 min before it cools too much to stretch, when this happens just put it back in the whey to warm it back up. It won’t soak up any of the whey after its been kneaded so don’t worry about that. I stretched mine 3 or 4 times, the more you stretch it the firmer it gets also it begins to look and act like string cheese. After your last stretch warm it back up and shape it into a ball and place it in an ice water bath to cool. Be sure to eat some before you cool it- it’s awesome! When cold, wrap with plastic wrap and it should last for several days in the fridge. No posts for over a year. Oops. I’ll try to be better. But hey, I made grape jam! This stuff has only 2 ingredients: grapes and sugar. Right up my alley. I started with about 2 pounds of seedless grapes, mostly smaller Concord grapes, but I threw in a few table grapes on top. After the simmering, remove from heat and puree (to desired consistency) with a hand blender. Add 2/3 cup sugar (more or less to desired taste) and put back on heat to simmer for about 25 minutes. Cool, store, and refrigerate overnight. It will thicken a little bit after being in the fridge overnight. If you want something more jelly-ish, you can add pectin. 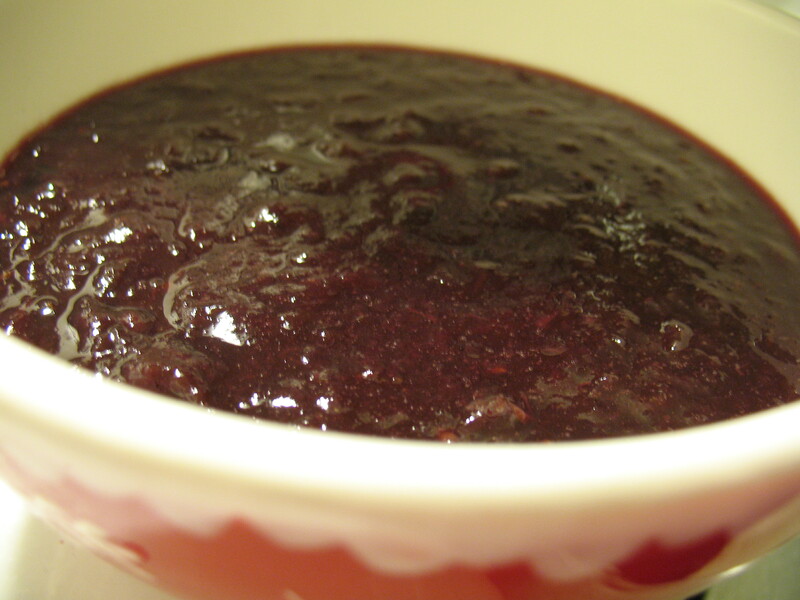 Grapes naturally have quite a bit of pectin, which is why you don’t have to add more unless you want to. I prefer the simplicity of the grapes + water + sugar recipe. I’ve been wanting to try these for a while. I’ve made a lot of spring rolls in my time, but I find that the taste of the fried spring rolls wrappers overwhelm the taste of the filling. 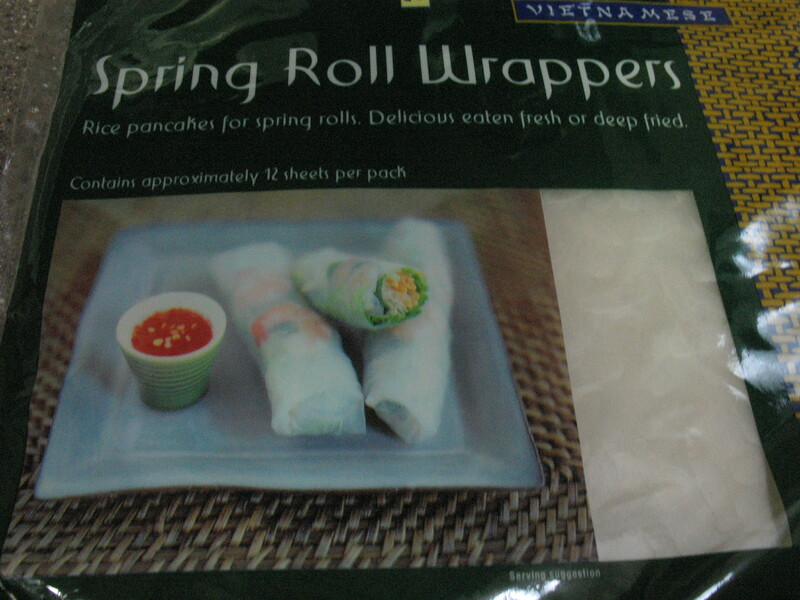 Summer rolls are traditionally made with rice paper wrappers and served room temperature. 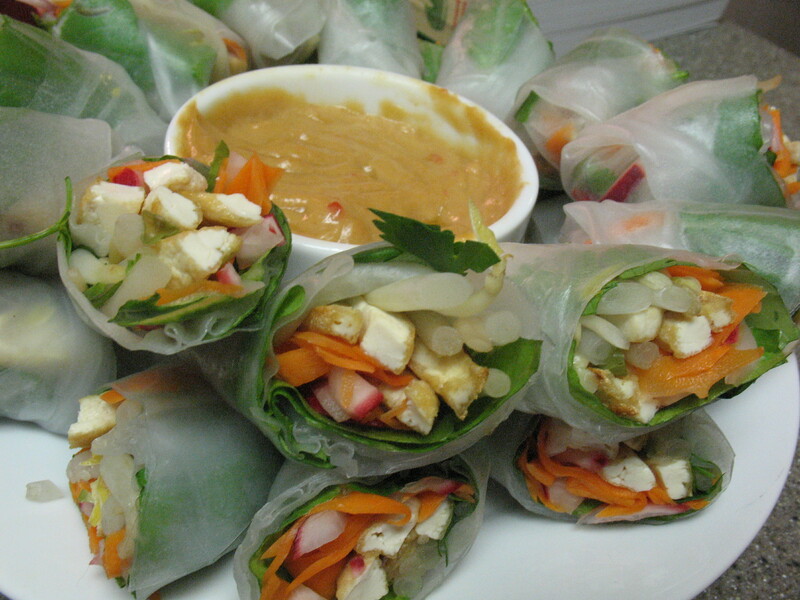 I found an endless number of recipes for summer rolls, and in the end followed none of them, instead making my own. I really loved the final product. Fair warning: they took me 2 hours to make! 1. 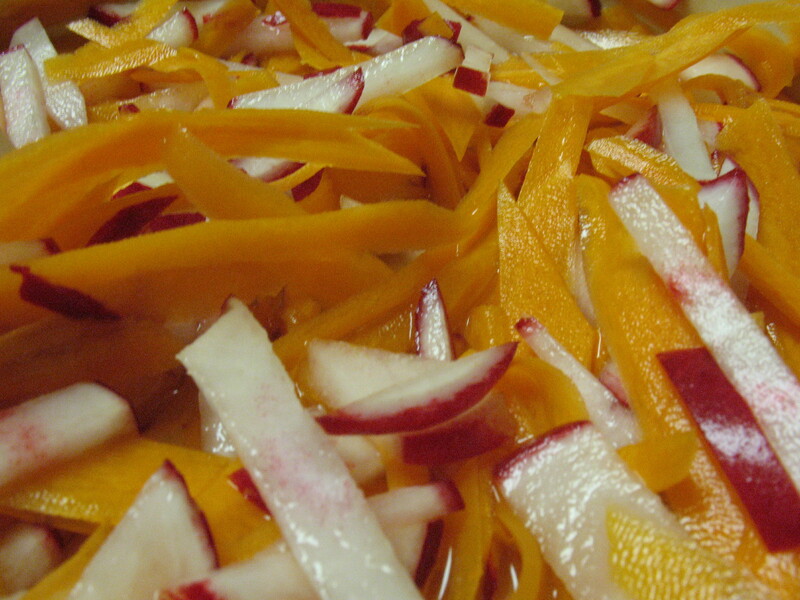 Shred the carrots and chop up the radishes. Soak for at least 30 minutes in a mixture of the rice wine vinegar and sugar. 2. Press the tofu for 30 minutes. Cut it into small strips and pan fry in sesame oil. 3. 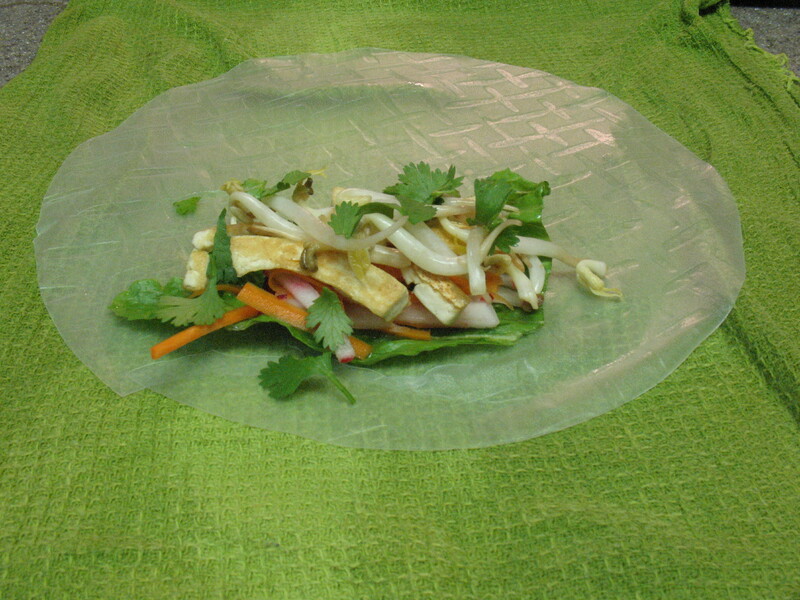 To assemble a roll, first soak an individual sheet of rice paper in warm water for about 20 seconds. Remove it from water and set on a wet tea towel. You should roll all of your, um, rolls, on the wet tea towel. 4. At the center and towards the bottom of the wrapper, first lay a small piece of romaine. On top of the romaine put some of the carrots & radishes, than a few tofu strips, followed by a few bean sprouts, and finally a few cilantro leaves. 5. Start to roll forward, the way you might roll up a burrito. 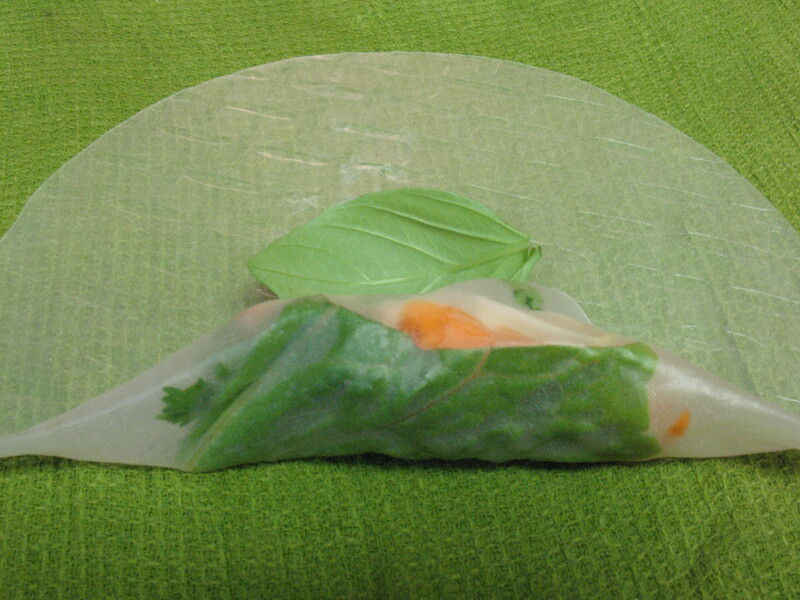 After you’ve rolled forward once, lay a basil leaf, pretty side down, on the wrapper. Fold the sides in and finish the roll. 6. There you have your rolls! I cut mine all in half on a diagonal (again, because it’s pretty and fun to see the cross section). 7. Get yourself a dipping sauce. I made mine with a peanut butter base, then doctored it up with sweet chili sauce, rice wine vinegar, and a little bit of soy sauce. This one gets hauled out around about July 11th annually for the fabulous Ms. Liva’s birthday. I grew up getting this treat only occasionally at my G-ma and Papa’s house. This post is mostly for me, so I can finally get the recipe off of post-it notes and into a more neat and readable form (eventually I hope to get G-ma’s potato salad, Dad’s cucumber salad, and Aunt Judy’s tabouleh off of paper scraps as well). 2. Melt 4 TBSP Earth balance/ butter and mix with 1/2 cup brown sugar. Spread this evenly in the bottom of your pan (a 9″ or 10″ round pan works well). 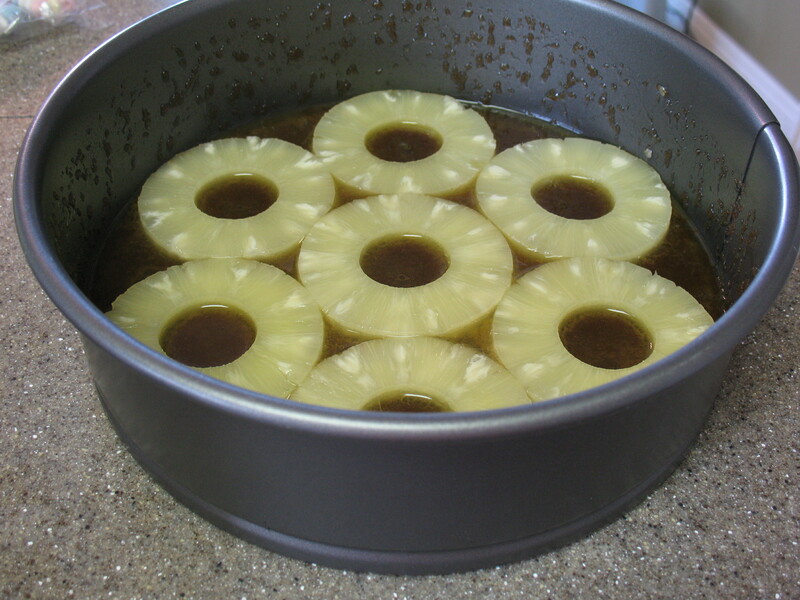 Then lay a single layer of pineapple rings (save the juice from the can) in the bottom of the pan. 3. 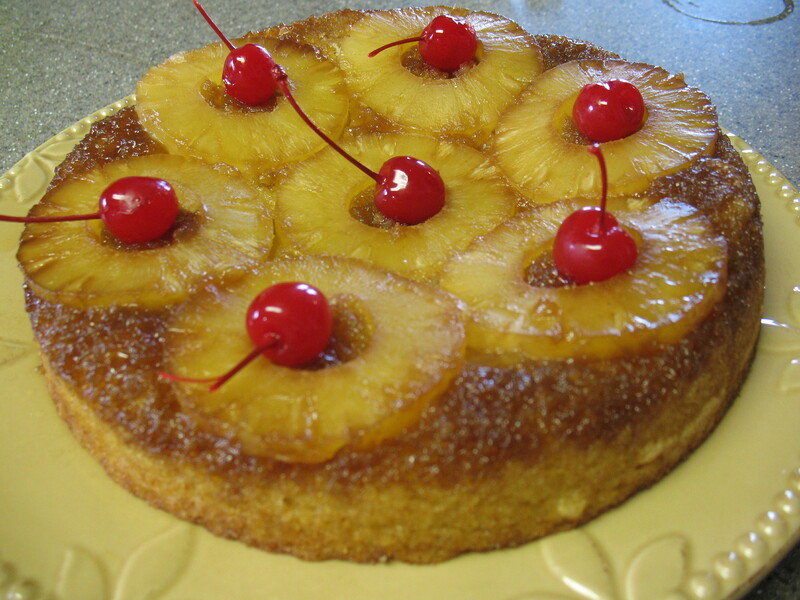 Combine the following cake ingredients in a medium bowl: EB/ butter, sugar, eggs, pineapple juice. 4. Combine the flour, baking powder and salt in a small or medium bowl. 5. Gradually incorporate the dry ingredients from step 4 into the wet ingredients. Add vanilla. 6. Pour batter into the pan and bake for about 35 minutes. 7. Remove from oven and flip out onto plate or platter. Garnish with maraschino cherries. Serve plain, with whipped cream, or with vanilla ice cream. 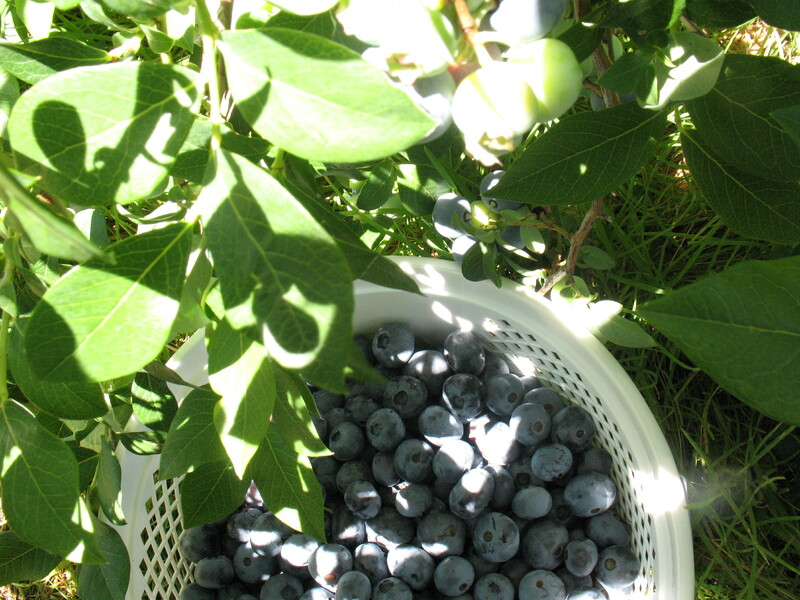 My dad and I went blueberry picking at LeDuc’s and made off with some major blueberries. 1. Mix the ingredients for the filling so that the blueberries are coated uniformly. Put the filling in the bottom of an 8 x 8 or slightly larger pan. 2. In a small-ish bowl combine the flour, baking powder, salt, and cinnamon. Set aside. 3. In a larger bowl cream together the sugar and earth balance/ butter. Beat in the egg and vanilla. Gradually incorporate the dry ingredients from step 2. Drop the batter onto the filling by the spoonful and then spread it evenly with a spatula. 4. Bake at 375 degrees for 35 minutes. 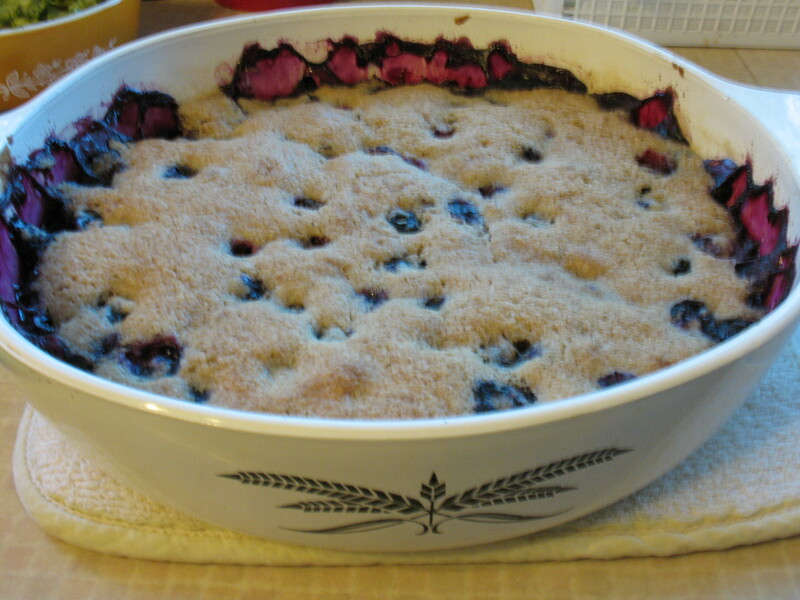 Let cool for long enough that the filling sets up, but not so long that the cobbler gets cold. Eat! Kelly absolutely adores sushi. I, of course, have limited options when it comes to sushi, what with being a vegetarian. We spent the last 2 days in Salt Lake City and the weekend ended up taking on a sushi theme. For lunch on Sunday we went to a sushi bar called The Happy Sumo. Amidst the many chain restaurants at the Gateway (huge outdoor mall we were at), this was one of the most appealing choices. I had the veggie tempura roll, which came with tempura yam, onion, zucchini, & shishito pepper inside, and was topped with avocado, spicy mustard, and one fancy red peppercorn each (I only ate one of the peppercorns, too much pepper for me). The tempura roll was awesome! Kelly has the Wasatch roll, which came with salmon, yellowtail, and cucumbers. I won’t pretend to have any sort of special knowledge or ability to judge sushi bars, but this place seemed like a midrange option (better than what’s available closer to home for us), and we were both really happy with our meal. Monday after breakfast we stopped into the Oriental Food Market (no website to link to, but it’s located at 667 S 700 E if you’re ever in SLC!) and left the market $60 poorer. 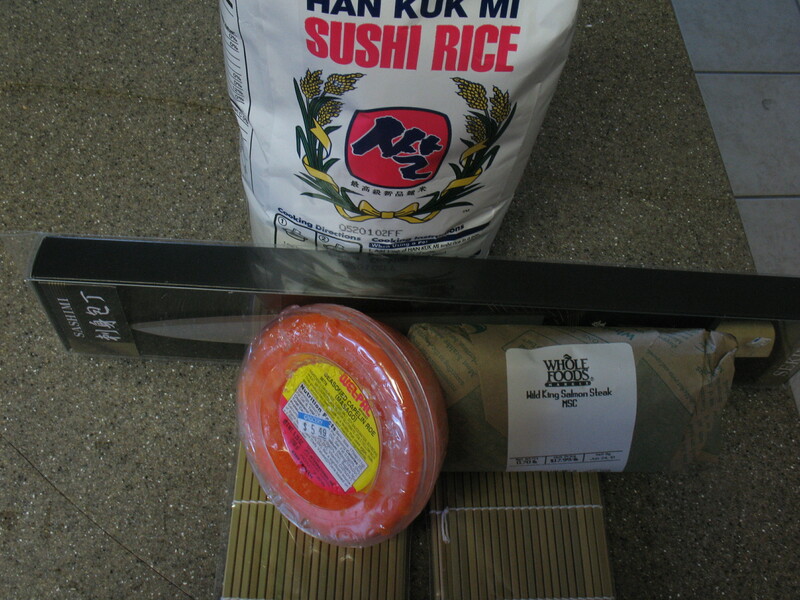 The market is Korean-owned, but has an amazing selection of Japanese, Chinese, and Indian products as well, even some Vietnamese candy 🙂 Many of our spoils were sushi supplies for Kelly, who has been wanting to try his hand at making sushi for quite a while. Here you can see his sushi rice, Sekiryu sashimi knife, capelin roe (masago), wild salmon (that part came from Whole Foods), and sushi rollers. The Amazon review of the Sekiryu knife is silly, because the dude’s only criticism is that the knife is sharpened on only one side (which is how sashimi knives are traditionally made, as it yields a sharper cutting edge). 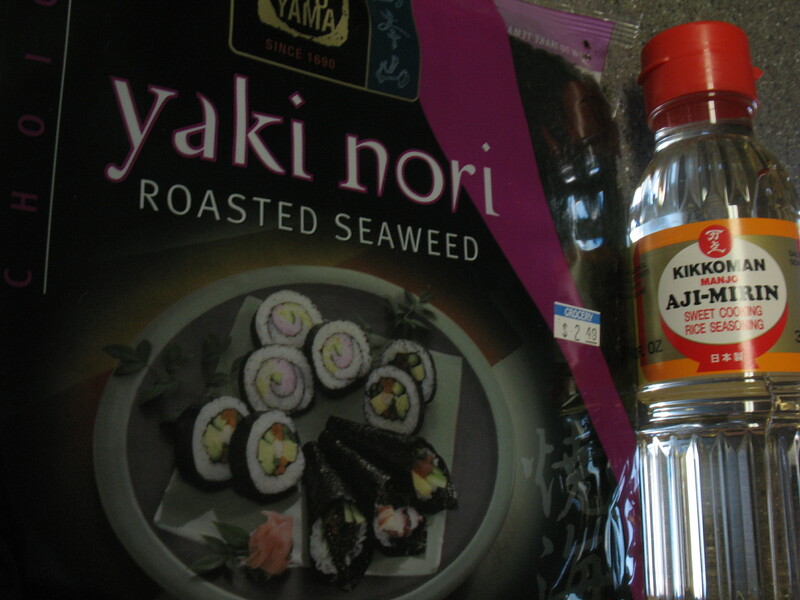 Of course we also had to get nori and mirin. 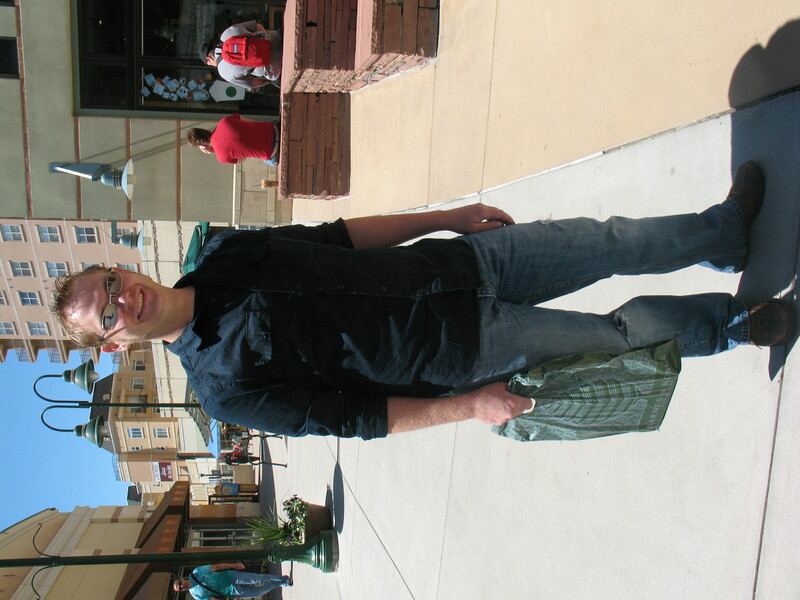 Then we ran back to the Gateway to buy a sushi book we had seen the day before. It’s called Sushi: Taste and Technique by Kimiko Barber and Hiroki Takemura. The book has wonderful illustrations and detailed instructions. 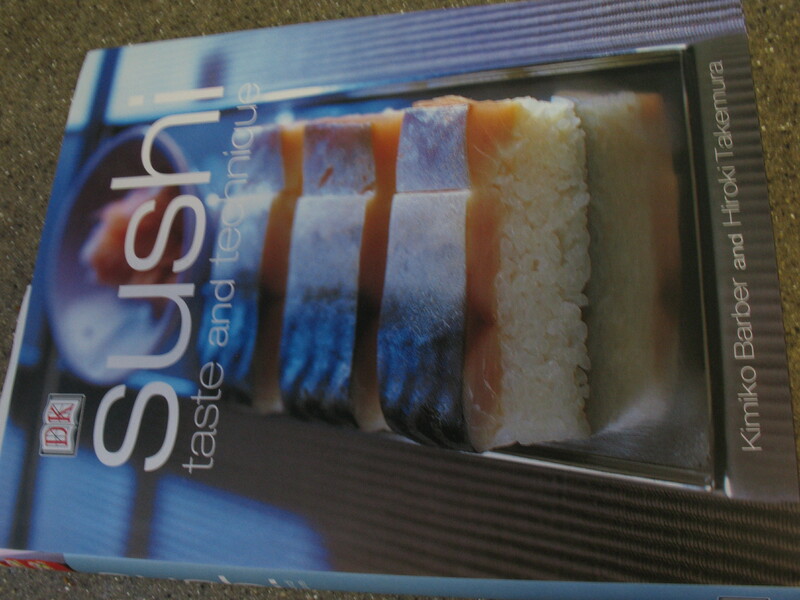 It includes information about the history of sushi, ingredients, techniques, etiquette, and common problems & solutions in making sushi. I’m sure he’ll be experimenting with all of his new sushi toys very soon. I’ll let you know how it turns out! I’ve started buying organic tofu from our local co-op, as I was scared off of GMO soy with the rest of y’all after seeing Food Inc. I love this brand (Wild Wood). It’s honestly super firm. 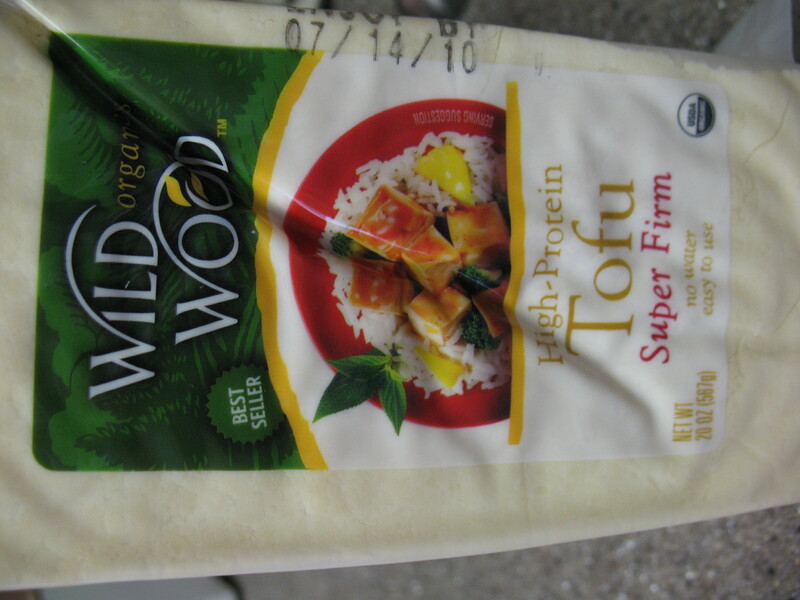 This is the only tofu I’ve ever bought that I saw no need to press. Also, this is a large package of tofu, which is why I decided to up the whole recipe around it. As for the sesame seeds, you can buy them toasted, but they’re so much cheaper to buy in bulk untoasted. To toast them yourself just put them in a skillet on medium heat until lightly browned. This should only take a few minutes. 1. Chop up the broccoli and steam it briefly, about 3-5 minutes. Remove from heat and run under cold water to stop the cooking process. Drain and set aside. 2. 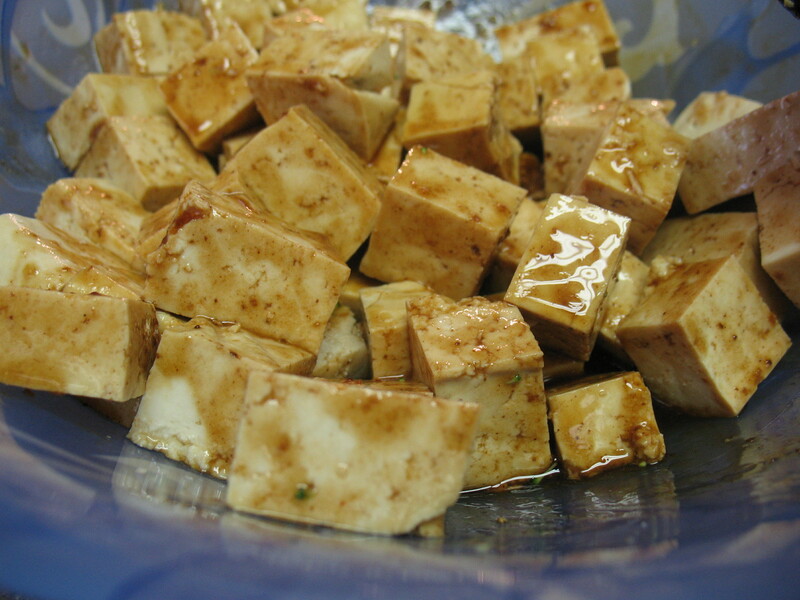 Prepare the sauce by mixing the sesame oil, soy sauce, hoisin sauce, and sesame seeds. Optional: if you like, before you add the sesame seeds, pour a little bit of the sauce onto the tofu (after you’ve cubed the tofu) and stir to coat. This will just give more flavor to the tofu. 3. 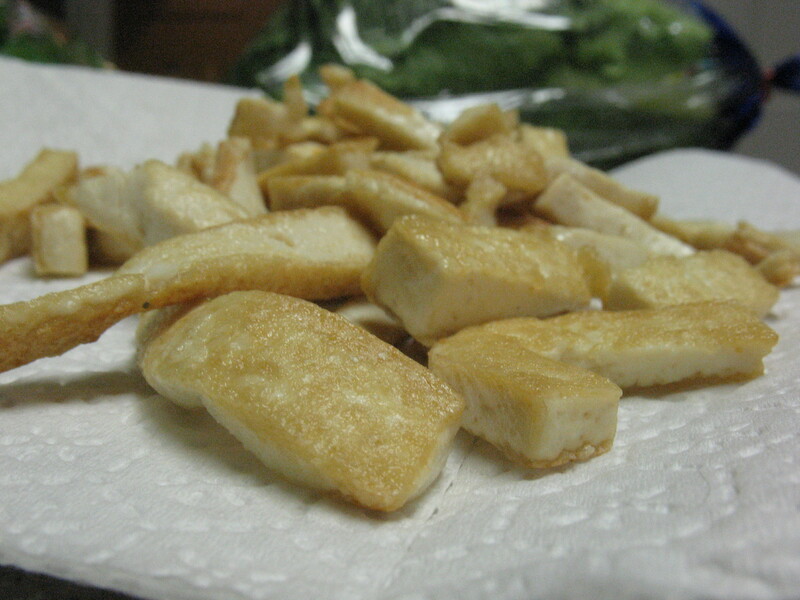 Brown the tofu in a skillet and then set it aside. 4. Stir-fry the garlic and peppers for a minute or two until softened. 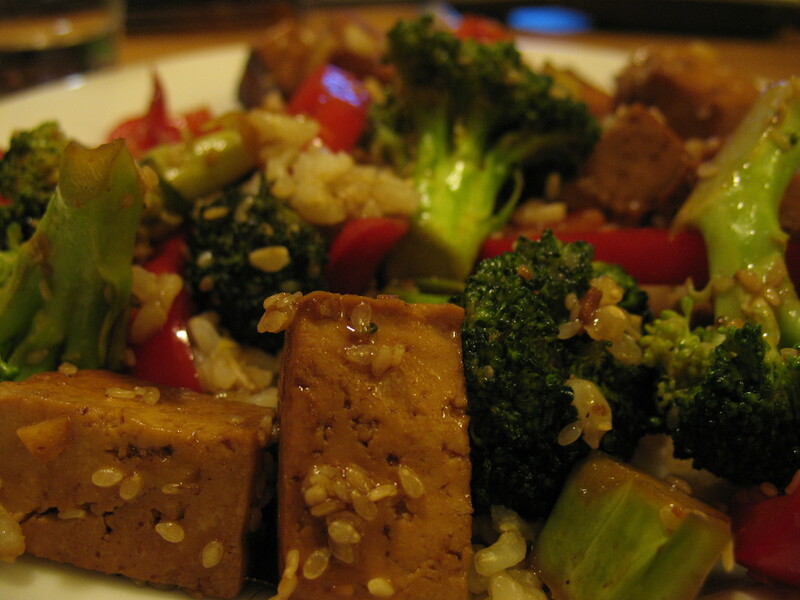 Add in the broccoli, tofu and sauce and stir-fry for about 3-5 minutes. 5. Serve over brown rice. Enjoy! Kelly and I eat a lot of artichokes. 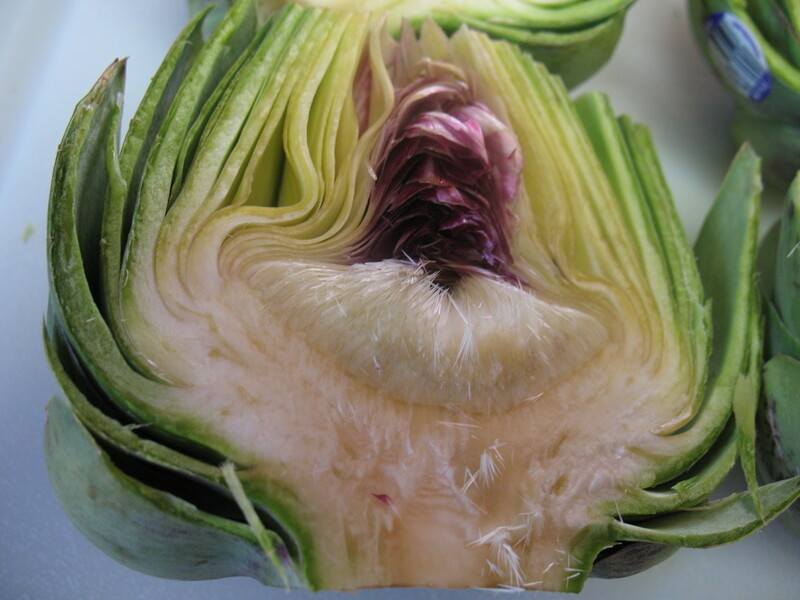 Usually we simply cut off the stem and then boil or steam them whole for ~45 minutes (time depends on the size of the artichoke, test by spearing the base of the artichoke with a fork). We decided to try grilling them. 2. 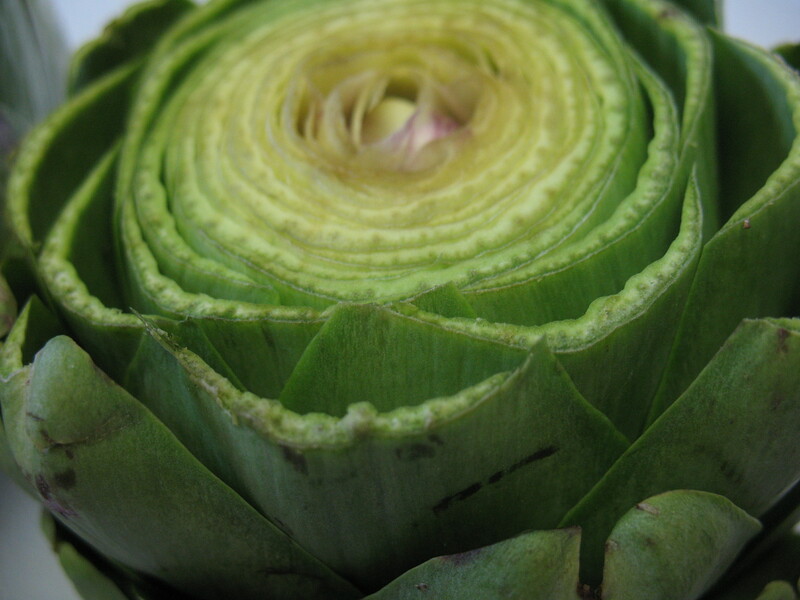 Halve the artichoke and remove the choke. 3. 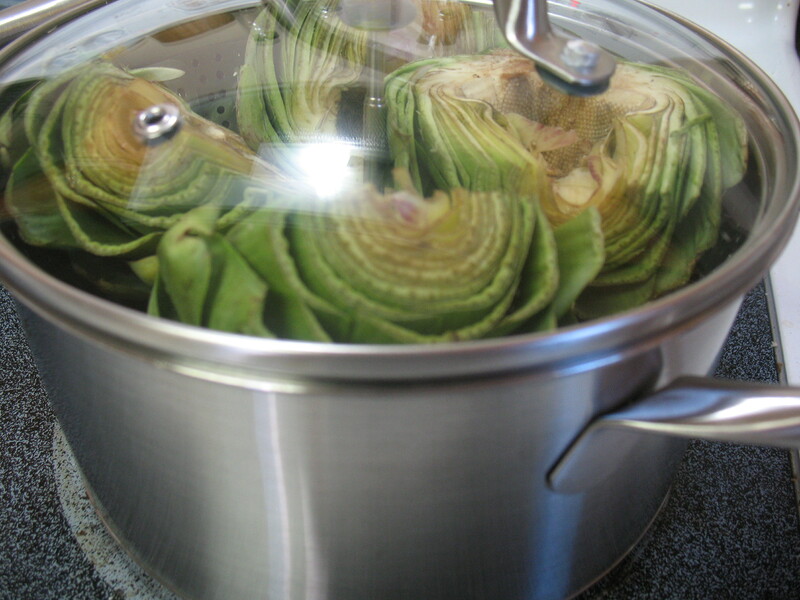 Steam the artichoke halves for 20-30 minutes, depending on size. 4. Tuck garlic in between leaves and brush cut side with olive oil. 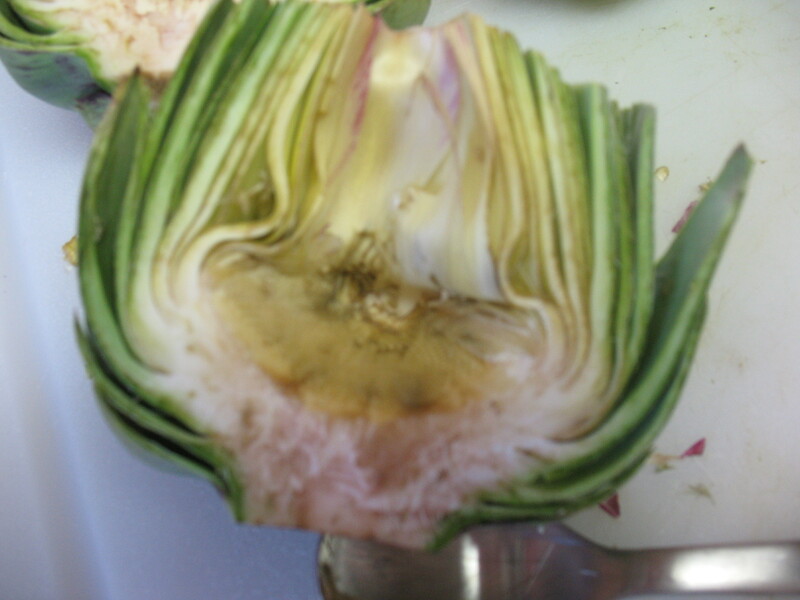 Dipping sauces for artichokes are generally oil, butter, or mayo based. I use a garlic herb olive oil that Kelly makes for me. Kelly uses a spicy mayo/soy sauce mix. 1. 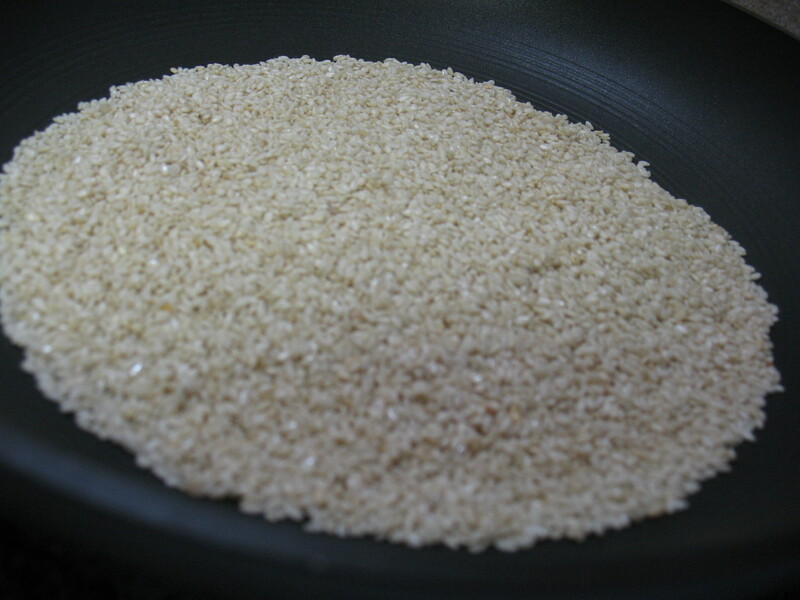 In medium saucepan combine rice, 2 cups water, and 1/2 teaspoon salt. Bring to boiling; reduce heat. Simmer, covered, 15 to 20 minutes or until rice is tender and liquid is absorbed. 2. Meanwhile, in blender or food processor combine 1/2 cup of the coconut milk, the cilantro, 1 teaspoon of the ginger, 1 garlic clove, and the lime juice. 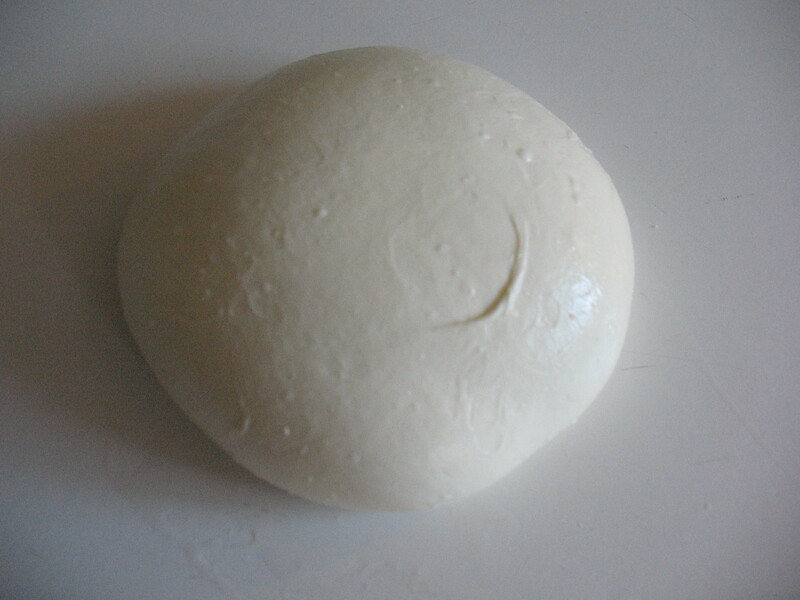 Cover; blend or process until nearly smooth. Stir into rice. Cover; keep warm. 3. In 12-inch skillet cook mushrooms in hot oil over medium heat for 5 minutes; turn occasionally. Add green onions, curry powder, red pepper, and remaining ginger and garlic. Cook and stir 1 minute. Stir in remaining coconut milk. Heat through. Season to taste with salt and black pepper. 4. To serve, divide rice among plates. 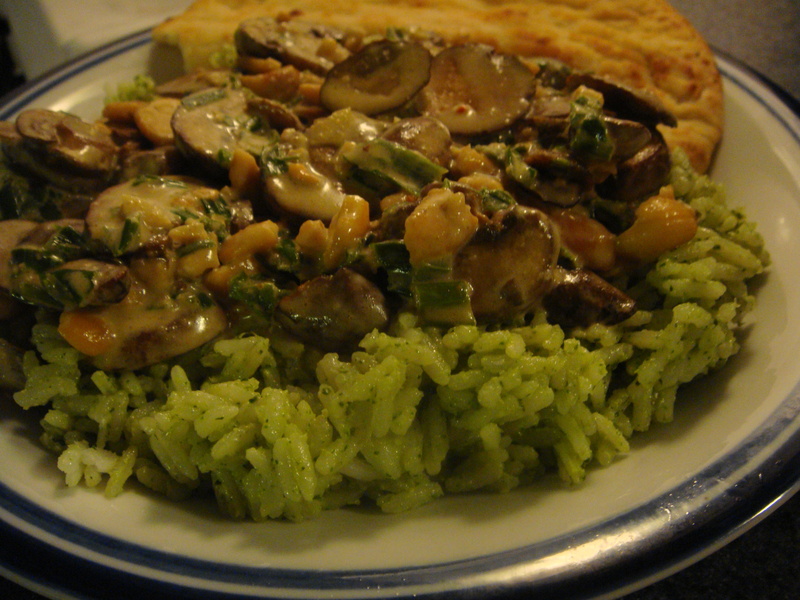 Top with mushroom mixture and sprinkle with nuts.